On the night of June 30th, anti-government protests in demanding clean water turned violent in the city of Khorramshahr in Southwest Iran, as anti riot police and plainclothes forces opened fire on protesters. Iran based Arab activists have said that one man has been killed and five have been wounded during protests against the shortage of water and lack of clean water in southwest Iran in (Zamaneh media did not confirm this independently). The protests have been ongoing in the past several days in two adjacent cities of Abadan and Khorramshahr – two cities near Iran-Iraq border that have been war-damaged during the Iran-Iraq war and that were never fully reconstructed. Residents of the two cities have been suffering from air pollution, water pollution, and unemployment. People came to the streets of Khoramshahr and Abadan because they said they cannot have a clean glass of water from the cities’ pipes. Videos have been circulating in social media with people opening up their house taps to water ranging from murky to muddy water. House tap water has been undrinkable and salty but right now the problem is that the cities have been denying the citizens this murky-muddy water which they used to wash with. The problem is related to a pipeline called the “Ghadir Water Pipeline” that provides the drinking water to the cities of Khorramshahr and Abadan. Last year, the first branch of the pipeline was running but right now the pipeline is broken in an area called Howaizeh district – this is the official narrative and the cities are working to restore water. 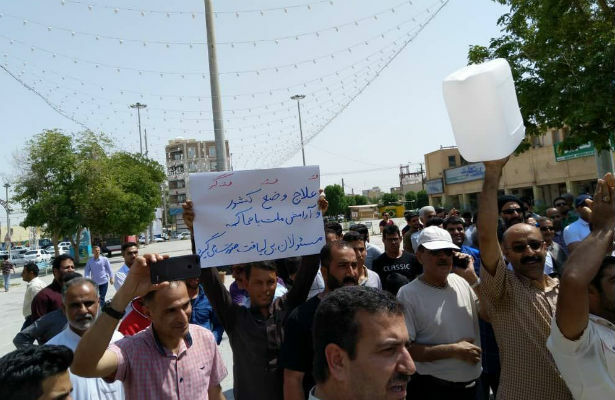 In meanwhile, the unconfirmed news is circulating among protesters that the shortage of water in the cities is related to Iran shipping and selling drinking water to neighboring countries. This has angered the protesters even more. The cities’ officials have denied this as a rumor and have promised to restore water within a week. The shortage of water, the quality of water and the rising price of filtered drinkable water, which citizens have to buy privately, have outraged the protesters. They have come to the streets with samples of their mud-colored tap water in hand. Some have taken their water containers to the city centers and Friday prayers and it has now turned into a protest that is being violently suppressed. The photos and videos circulated in social media from the Saturday night protest show teargas and the sound of the firing of machine guns is in the background. Protesters chant slogans about their rights have clean water and clean air – slogans that have been consistently repeated in the past week on the streets of the two cities. On Friday, in Khoramshahr people gathered with empty buckets of water in front the city’s main Friday Mosque and protesters demanded an answer. The Friday prayers was overflowed with protesters to a point that the prayers was interrupted and ceased to continue. State media IRNA has confirmed that protests have been taking place in the two cities and that tear gas has been used but this outlet has not yet confirmed the number of those arrested, killed or wounded. Families in Abadan and Khorramshahr have to use bottled water for even washing and they cannot afford it anymore. A labor worker has told Mehr news agency that “recently the price of water has doubled, I am a worker, and how am I supposed to pay for this?” He continues to say that one cannot even wash their face with tap water in Khorramshahr and the family of this 40-year-old man cannot even use filtered water for drinking because of it often being very salty. City officials have been talking to state media in Iran on Sunday after the violent suppression of protesters reassuring them that residents have returned to their houses. However, the protests have become a daily and nightly routine and it is yet unknown if the residents of the two cities will come to the streets yet another day.